This year’s 24th Annual Children’s Fest promises a weekend filled with spectacular live entertainment and an array of exciting hands on activities that are sure to please children 12 and under. There’s something for everyone in our expanded lineup of family friendly activities from sports and games, to experimenting with science and dabbling in the arts. Since its inception in 1995 as a project of the Rotary Club of Windsor (1918), more than 74 thousand visitors have attended our annual Children’s Fest, coming from all over the region to enjoy the weekend activities and family fun. This year the Bulimia Anorexia Nervosa Association (BANA) will once again be co-hosting the event. 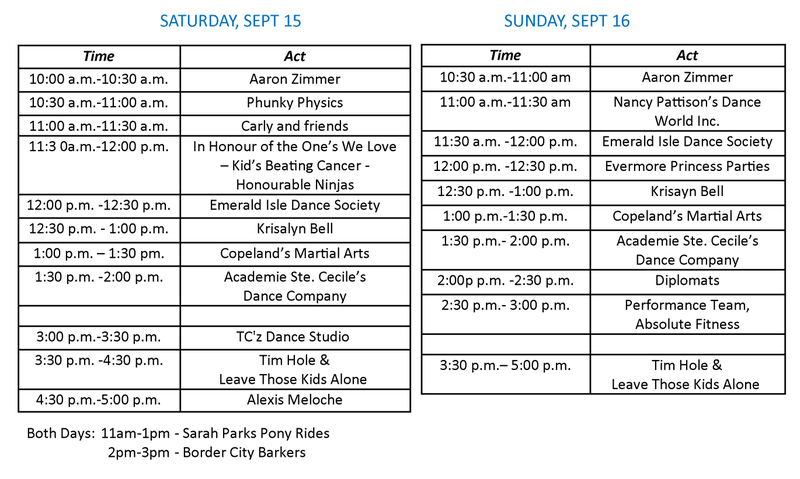 Gates will be open Saturday and Sunday 10am-5pm For fabulous fun, food and festivities, there’s something for everyone at Children’s Fest September 15-16, 2018. Looking forward to seeing you all at our new home on the corner of Central Ave and Grand Marais. Children’s Fest provides the opportunity for families to enjoy a two day weekend of fun for only $5 per person (children under 2-free). Everyone gets a wrist band so that they can come back again on Sunday. Stage shows, bouncy castles, special activities and the opportunity to meet many of your children’s favourite characters are all included in the ticket price. Food is available at reasonable prices and the vendors that attend the event are child focused. Children’s Fest is a child-centered, cost effective way to have a “staycation” with your family! All proceeds raised by Childrens Fest directly support LOCAL charities such as BANA and Rotary Club of Windsor 1918 charities.